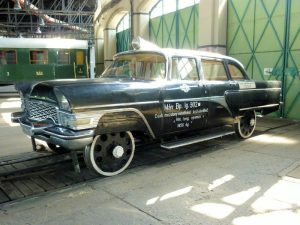 The museum caters for families as well as the enthusiast and there are rides on the 7¼” ground level railway, model railway layouts to see and various souvenir and refreshment stalls dotted about the site. 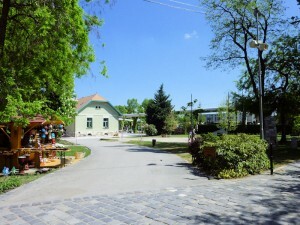 There are also plenty of play areas for when the kids get bored. Special events are held throughout the year and details can be found on The Museum Website which is available in English and has plenty of useful visitor information. 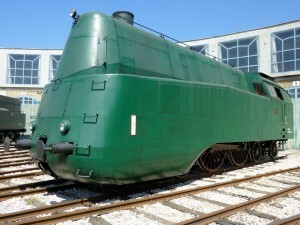 Most of the labelling and signage is multi-language but the loco details are mainly in Hungarian. For something a little different you can ride the turntable for free. I took plenty of photos but have only put a few on the Journeyman’s Workshop to whet your appetite. There is quite a lot of information on the web and a good site with plenty of images and the information from the exhibit labels is Friends of the Museum the website is in Hungarian and to get you started: Gőzmozdonyok is Steam Locomotive and Dízelmozdonyok is Diesel Locomotive, easy! If you try Google Translate on the technical information it doesn’t work and as my Hungarian is sparse, to say the least, I’m afraid I can’t help. 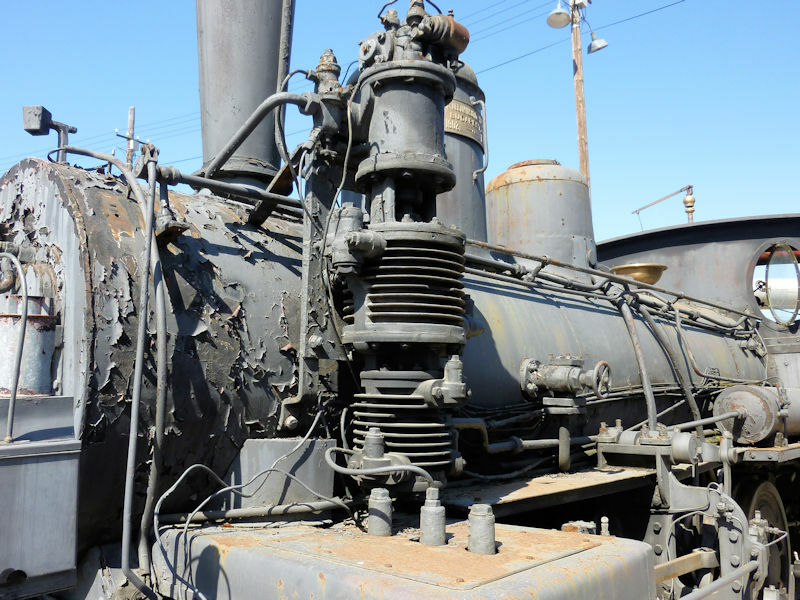 The main display of steam locomotives is around one of the two operational turntables. There are about 20 feeder tracks to the turntable each with it’s own loco and some with extra rolling stock. Diesel and electric locos are in the marshalling yard on the other side of the turntable. 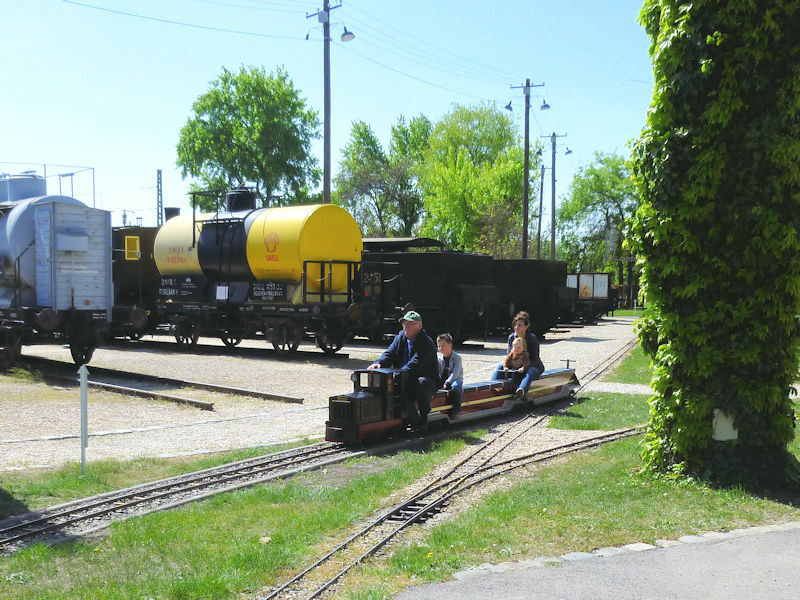 The first picture (click for a bigger image) shows some of the exhibits displayed around the turntable. This turntable even has a cabin for the operator and you can ride for free through a full 360° spin. Power to make it turn seems to be delivered by the catenery cable and the drum suspended over the centre of the turntable. 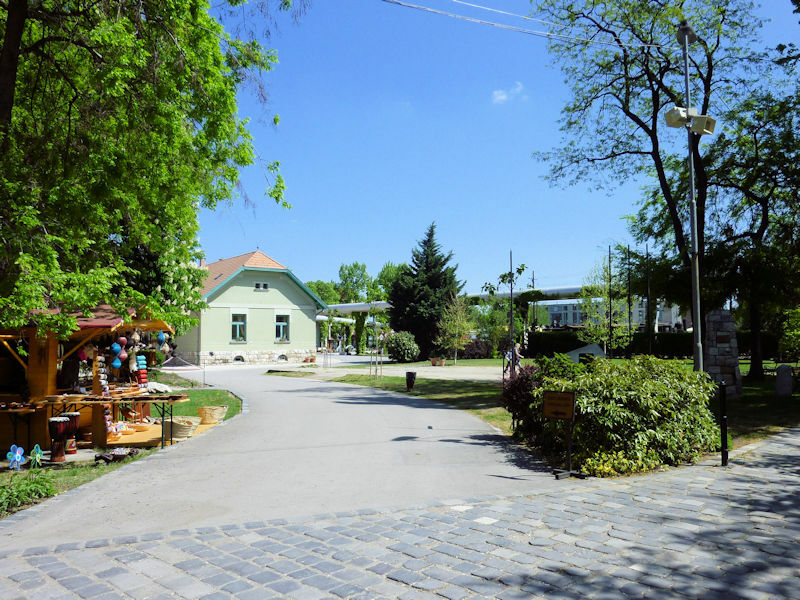 Keep going clockwise round the turntable and you get to MÁV 520,034. 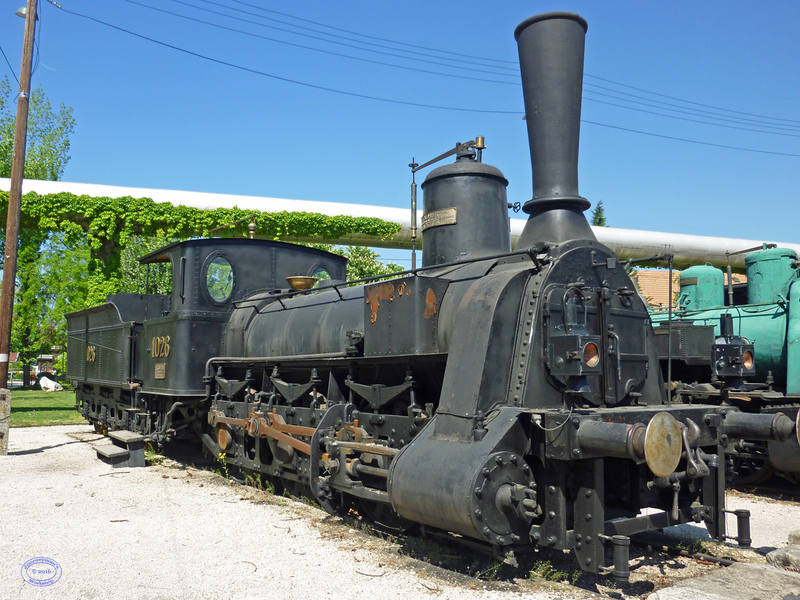 This is a 2-5-0 freight loco (UIC 1’E h2) 2 cylinder superheated. 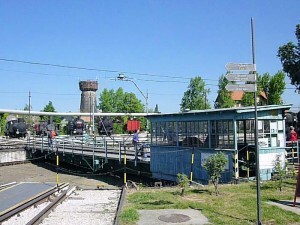 Built by Oberschlesische Lokomotivwerke, Katowice, Werk Krenau, Poland, in 1943, Works no. 1165. 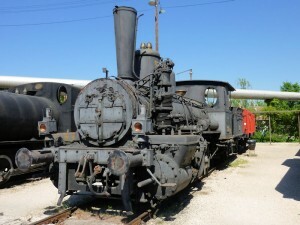 The loco worked in Germany and Russia before coming to Hungary probably in 1962. 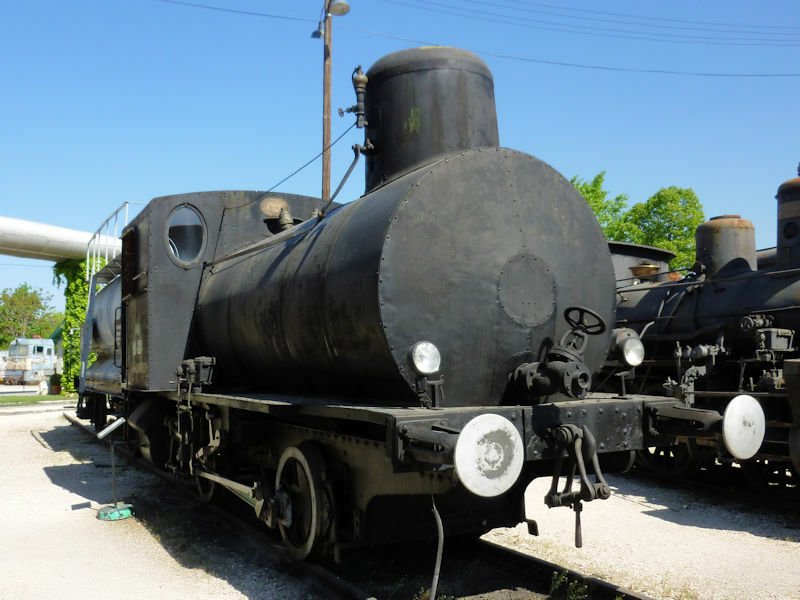 The loco worked up until 1984 when steam power was phased out in Hungary. There are some unusual engines at the museum and this fireless 0-4-0 tank loco 91,001 (UIC B-f2t) is definitely different. Technically it probably isn’t a tank engine as it has no tank or firebox, just a large steam receiver. Designed for working in hazardous environments, the receiver was just filled from the factory steam main as required. 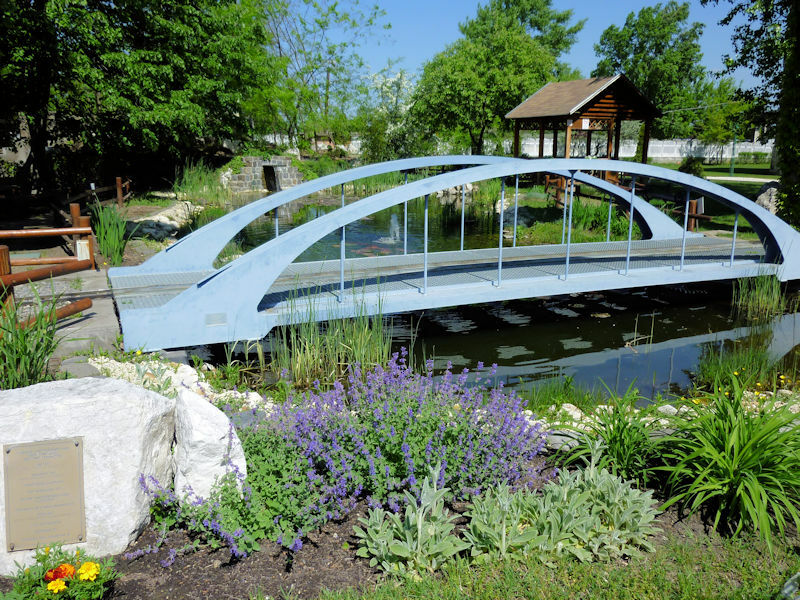 Built by Lokomotivfabrik Krauss & Co. of Linz am Donau, Austria in 1915. MÁV 7111 is an 0-6-0 tender locomotive (UIC C-n2v). 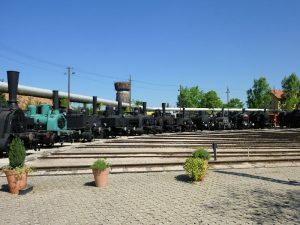 Built at the Royal Hungarian State Railway Factory, Budapest in 1902 and last worked in the Mecsek coal mines up until 1986, when it was retired and later restored. I was interested in the steam pump on the left hand running board. at first I thought it was a feed pump but the cooling vanes make me think it is possibly an air compressor for the braking system. 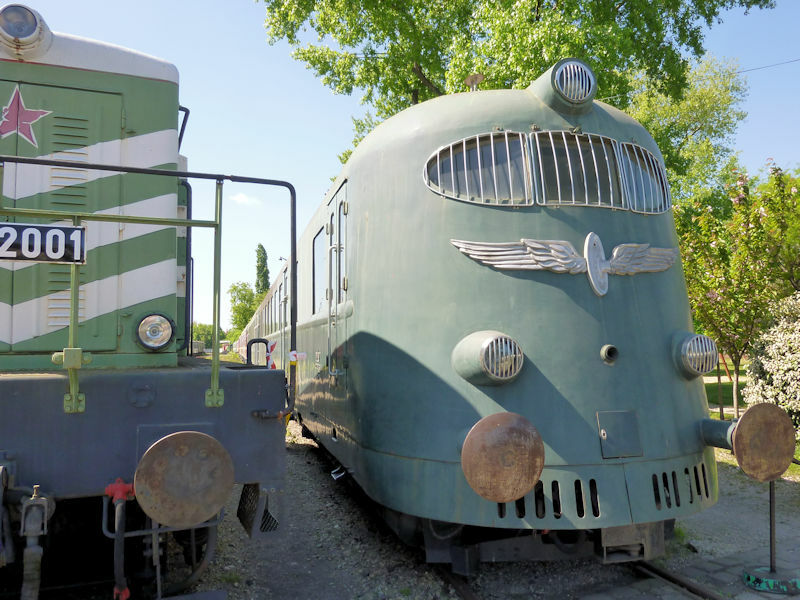 Just out of interest the full version of MÁV is Magyar Államvasutak (Hungarian State Railways). Another unusual engine is 242,001, at first I thought this was armour plating but it is just streamlining. 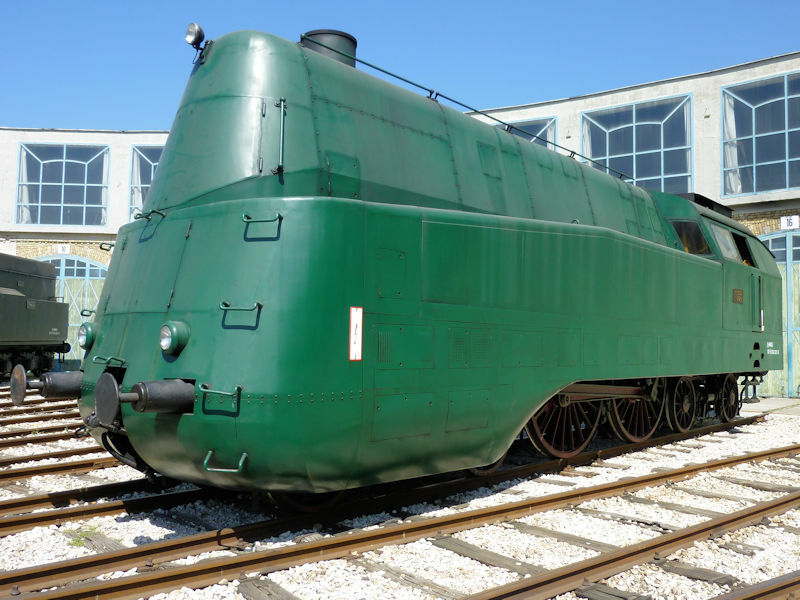 Only four class 242 locomotives were built and hiding underneath the plating is a 4-4-4 tank engine (UIC 2′B2′St). 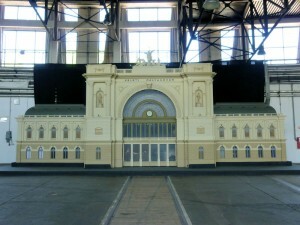 Built by MÁVAG (Magyar Királyi Államvasutak Gépgyára; Hungarian Royal State Railway Factory), Budapest in 1939. The loco was designed for high speed passenger services and the wheel arrangement allowed fast running in both directions. Restored in 2002 the loco still runs and is used for enthusiast excursions. If you fancy a bit of exercise you can have a go in one of these hand-propelled inspection vehicles. 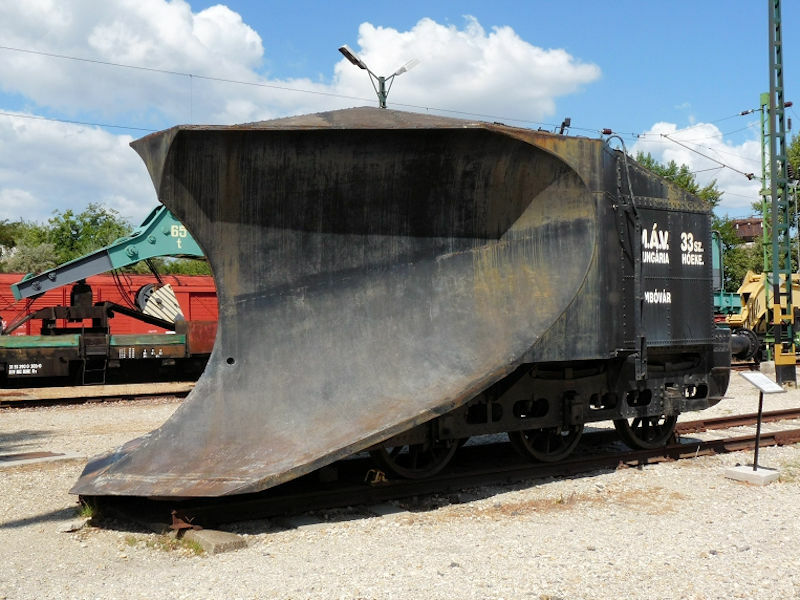 And just in case it gets cold – MÁV 33, built in 1915 this snow plough was in use up until 1988/9. 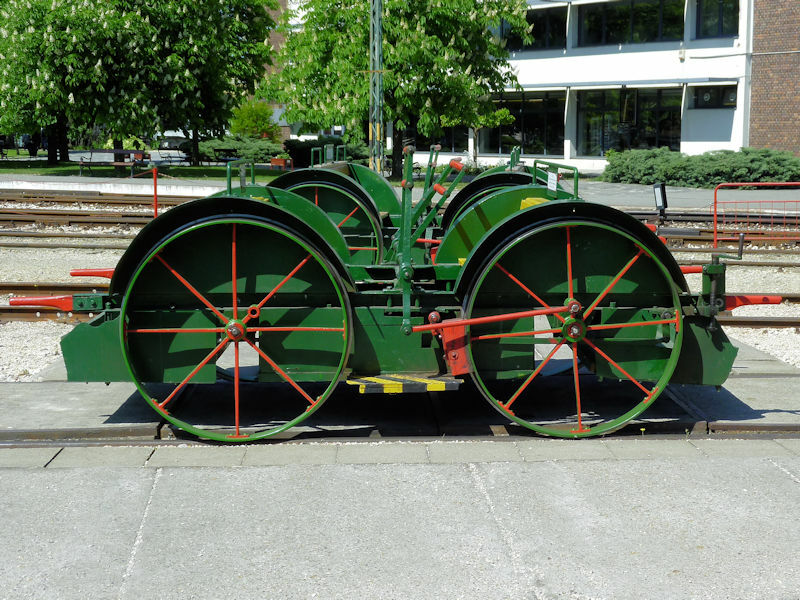 The hollow body of the plough was filled with sand to increase the weight and improve traction. There are several other snow ploughs at the museum including a slightly newer snow blower. 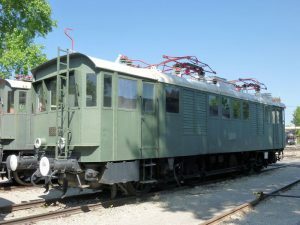 The museum also has examples of diesel and electric locos. 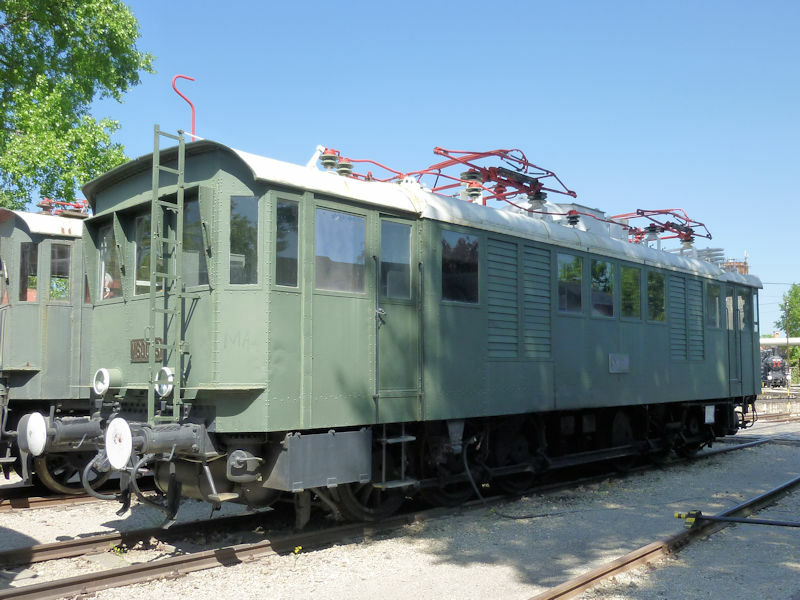 MÁV ‘Hargita’ is a 3 piece diesel railcar built by Ganz & Co. (Budapest) in 1944 but was not put into service until 1951 when it was adopted by the then government for use as travelling offices. 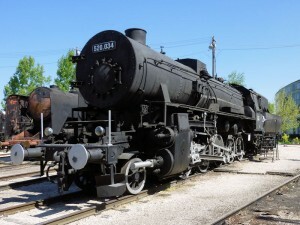 The name does not appear on the loco and I don’t know if it is just the class type, Hargita is a town in the Hungarian speaking part of Transylvania. 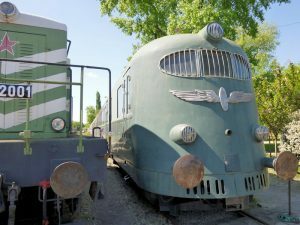 MÁV V60,003 Kandó Class electric locomotive, 0-12-0 (UIC F) and 67 km/h maximum speed built in 1938, named after Kandó Kálmán, who designed the class V40 and V60 locomotives for MÁV. 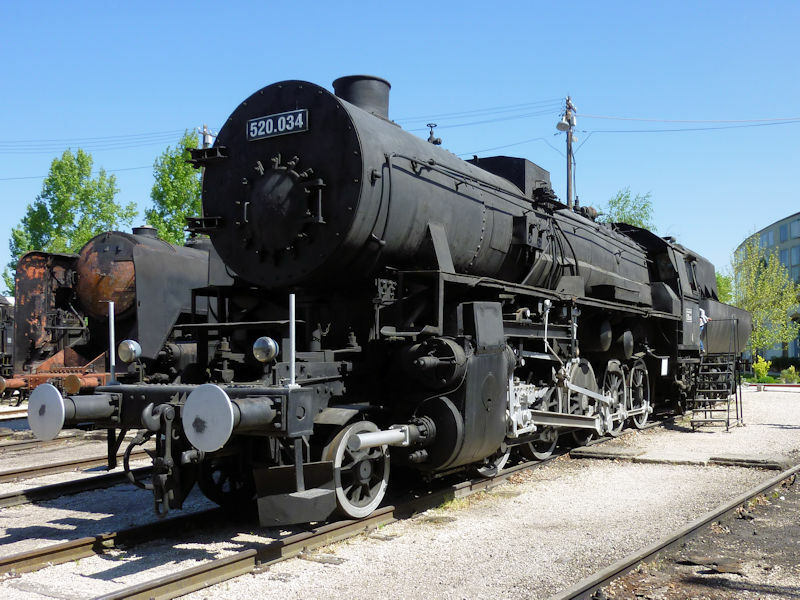 Only three of this class loco were built being used for heavy freight trains, mainly coal trains from the Oroszlany area to Budapest. 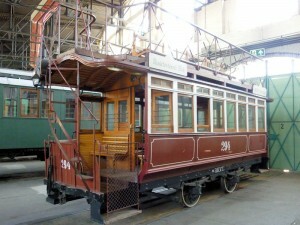 This “inspection vehicle” is on display in the huge 34 bay roundhouse. Based on a Russian GAZ Chaika saloon car it has been adapted with solid wheels to run on standard gauge rails. Still operational and you might get a ride! 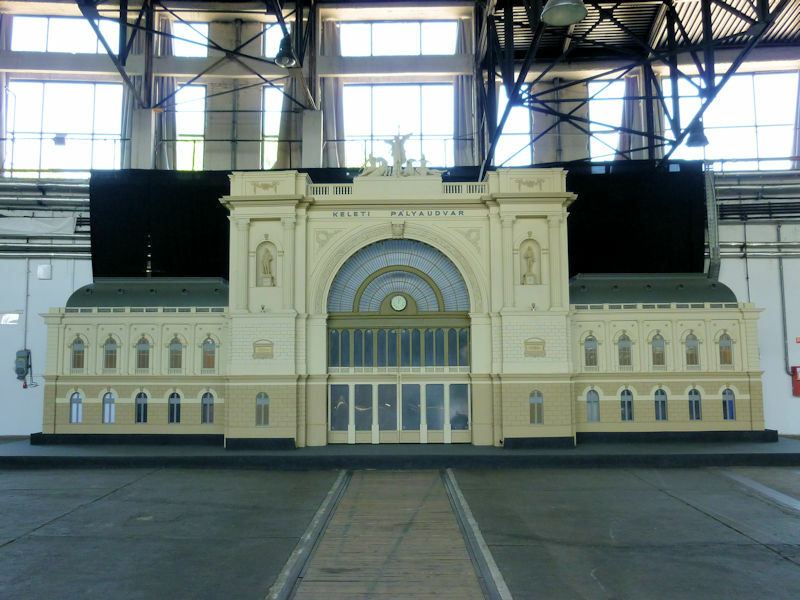 Also inside the roundhouse along with some interesting rolling stock is this model of Keleti Station, One of the four main railway stations in Budapest. Close by to the station model is a replica of an old horse drawn tram which I believe is used to give rides at weekends. 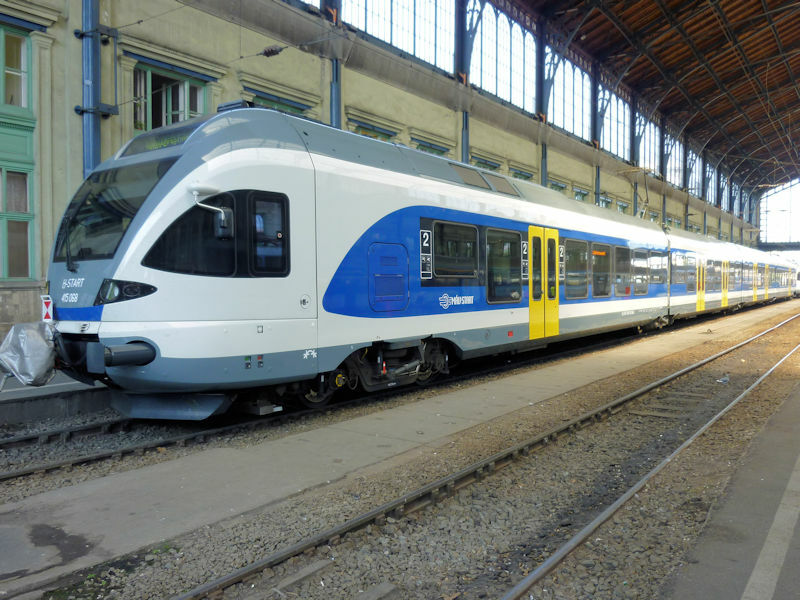 Not in the museum but an example of modern Hungarian railways is this Stadler FLIRT – MÁV 415,068 in MÁV Start livery. The FLIRT (Fast Light Innovative Regional Train) is made in Switzerland by Stadler Rail AG. This is the electric version but it is also available as a diesel. Common throughout Europe and even now in America. 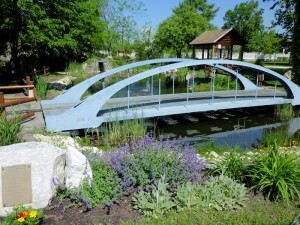 Most commonly as a four-section train UIC Bo′2′2′2′Bo′ but can be reconfigured. The grey cover at the front protects the automatic coupling. And staying with present day railways, a closing view of Nyugati Station where MÁV 415,068 was snapped. 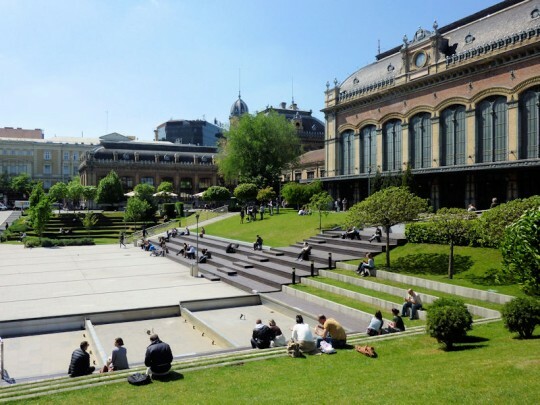 The concourse at the side of the station is home to a number of restaurants and shops and the old station building has been nicely renovated. Should you visit Budapest the Railway History Museum is worth a visit and public transport throughout the city is clean, pretty efficient and free if you are a EU pensioner (ID card or passport required). 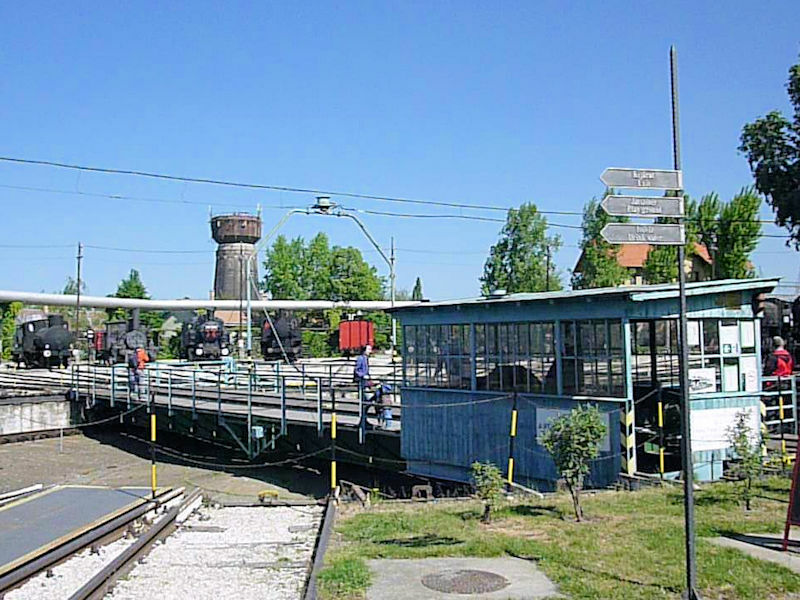 The No.2 tram along the Duna (Danube) is worth a ride just for the view but all trams tend to get very crowded especially the 4 and 6 routes and it is best to avoid rush hour! Thanks for your website as it helps me to tie up some of the locos I saw there in 2014. Did you manage to get a stocklist? I tired to ask for one but the assistants English was as good asmy Hungarian. Hi John, Sorry no stocklist, best I could find was on the Friends of the Museum site. Your Hungarian is obviously as good as mine! 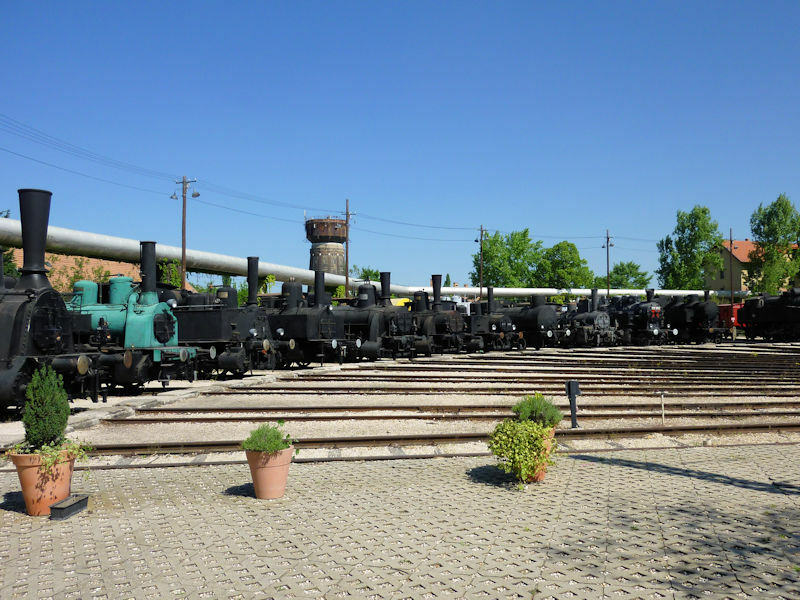 Wikipedia has info on some of the locos and I found a couple of other sites Twentieth Century and Train Mania are quite useful with use of Google Translate which whilst reasonable with ordinary language is not quite so good for the technical info.